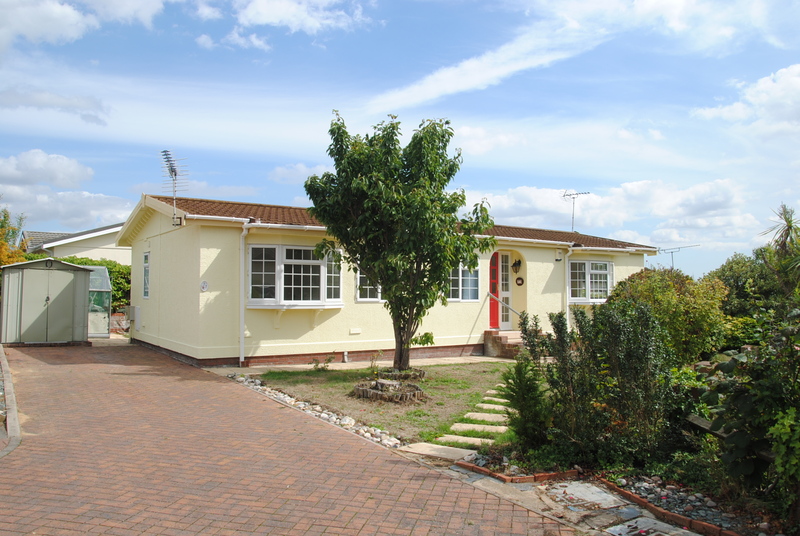 The Tingdene Dolben Lodge is an attractive modern park home bungalow in a central location on Priory Court. 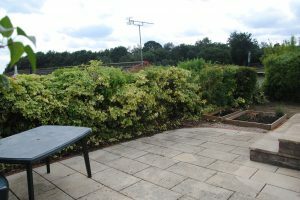 The south facing plot has a garden to the west and patio areas to the east and south. 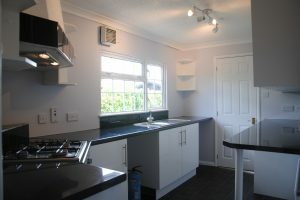 This home has been newly re-carpeted, re-decorated and fitted with a new kitchen before coming onto the market. The construction is timber frame with Decra tiled roof and double glazed uPVC windows. Central heating is by lpg fired boiler. The front door in a recessed porch leads to the entrance hall with a door into the Living Room (16’9″ x 11’2″). 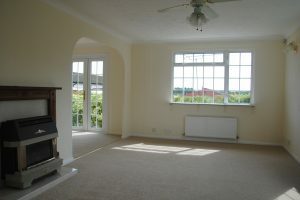 Two large windows to the western and southern aspects give the room plenty of light. The fireplace is a focal point for winter evenings. An archway leads into the Dining Room (9’1″ x 8’3″) with French doors facing south and opening onto the patio. A door leads into the Kitchen (8’6″ x 9’6″) with numerous cupboards in white, a breakfast bar, fitted eye-level oven and lpg hob. There is plenty of storage space including a large cupboard enclosing the boiler and hot water cylinder. 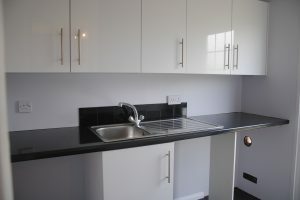 A door opens into the Utility Room (5’3″ x 8’0″) with cupboards below the worktop plus a full height cupboard. 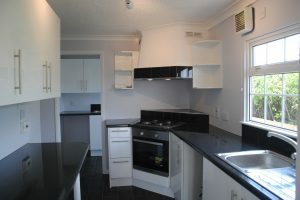 There are also spaces for a freezer, washing machine and dryer. A glazed door opens into the garden on the east. A door from the kitchen leads back into the entrance hall with doors to the bedrooms and bathroom. 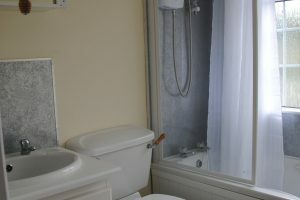 The Bathroom (5’6″ x 9’7″) features a suite comprising WC, basin with vanity unit and bath. The Master Bedroom (10’6″ x 9’7″) has a dressing table with drawers and window overlooking the garden. 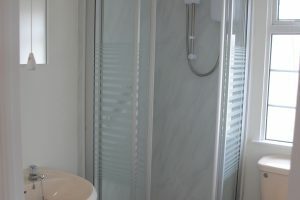 There is a walk-in wardrobe (6’0″ x 5’2″) with ample hanging space and en-suite (6’0″ x 6’5″) with corner shower cubicle, basin and WC. Bedroom Two (10’0″ x 9’7″) has fitted wardrobes. 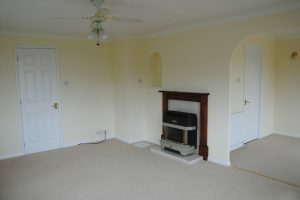 There is a further room (6’11” x 6’5″) which can be used as either study or a small third bedroom. A block paved drive provides parking for up to two cars to the north of the home and leads to the large shed at the rear. 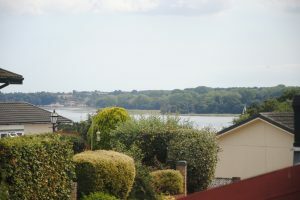 The garden to the west is currently grassed and to the south and east there are patios and decked areas.